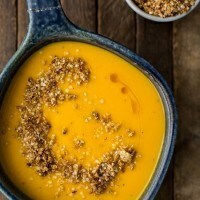 Sesame Kabocha Squash Soup | Naturally.Sesame Kabocha Squash Soup | Naturally. Preheat oven to 400˚. Take the squash and slice in half (1). Cut into quarters, scoop out the seeds (2) and place in a roasting pan. Drizzle with olive oil (3) and roast until squash is tender, 35 to 45 minutes. Remove from oven and let cool enough to handle. While squash is roasting, make granola. Combine the quinoa flakes with the sesame seeds and salt in a bowl (4). Add in the olive oil and honey, stirring until everything is combined and the quinoa flakes are well coated (5). If the honey is thick, heat slightly before using. Pour the granola onto a baking tray covered with parchment paper and pat down into a thin layer (6). Bake for 10 minutes; the granola should be lightly browning around the edges. Stir slightly and return to the oven for another 5 to 10 minutes or until the granola is golden. Remove from oven and let cool. While the squash and granola is baking, heat a pot over medium heat. Add olive oil followed by onion. Cook until the onion is translucent, 6 to 8 minutes (7). Add in garlic and ginger, cooking for another minute. Add in 2 cups vegetable broth (8), bring to a boil, and turn off heat. Once squash is done roasting and cool enough to handle, scoop out the insides into a blender (9). Add in the vegetable broth (10) and puree until the soup is smooth (11). If the soup looks too thick, add splash more vegetable broth. Return the soup back to the pot (12) and heat over low until warm. Serve with a sprinkle of granola and a very light drizzle of sesame oil. If looking to reheat this soup throughout the week, you will most likely need to add additional broth during the reheating process. You can also use cream or coconut milk, depending on the flavors you would like. For a quicker meal, roast the squash ahead of time, up to 3 days in advance, and save in the refrigerator. Use caution with the sesame drizzle- it’s easy for the oil to overpower the soup. I recommend pouring it into 1/4 teaspoon and drizzling from there.